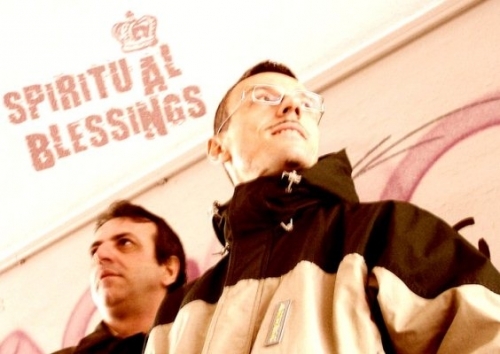 Spiritual Blessings is a DJs Duo born at the end of 2004 from an idea of Jean Paul François and Ezio Centanni. They are 2 buddies with a common imaginary: make good and high quality music. Ezio & Jean are 2 Djs with over 25 years experience, and they played in clubs over Italy and Europe. Ezio began his adventure in Radio in the 1981 and five years later he had a great idea to start one of the best House Radio Stations in South Italy. In '97 Ezio goes in touch with dj-producer Costantino Mixmaster Padovano,, and hence forward he starts his interest for productions. Dj Ezio is a sequencer genius, and his hard work in SB's Studio like Production Engineer, Mixer Arranger and Drum Programmer, confirm his endless knowledge in music. Dj Jean began to study Piano since he was 5 years old. his father is is a Piano Player who loves Jazz and Bossa Nova.. In ‘90 Jean Paul touch first clubs, and starts an interesting musical trip, spacing trough several House Music styles and many fusions.Jean Paul thinks that to play House Music, the Dj needs musical substrate, and DJ that spins records is like a musician that touch piano keys. Need same love and passion. Today, His 4/5 hours House Sets are rich of Soul, Funky, Bossa, Disco, Jazz, Latin influences, and His groove is really exclusive, and moves people until the deepest atmo to the earliest hours of the dawn. Spiritual Blessings have produced at the moment a lot of tracks for many labels like Stealth, Mile End, Mixed Music Signals, Next Dimension Music, Soundman on Wax, Gotta Keep Faith, Del Records, Nu Deep Music, Cabana. Thanks to tight partnership with Jazz Maestro Gianni Lenoci, Spiritual Blessings take a Deep Jazzy taste that push this duo over common house music experiments. In May 2006, Spiritual Blessings started own records label Gotta Keep Faith Records. DJ Jean is the Label Manager & Director and dedicates all time to produce in studio his personal works and manage all label’s stuffs. Now Spiritual Blessings have launched the second records label all funky, jazz and breaks flavoured, Sobra Recordings and started a music distribution representing the Dj Rico & Pierre Garcia’s French label Nu deep Music, GramophoneDzie’s label Disko Zoo and new amazing labels : Spirit Sound Records and Vialocal Recordings.